Clipper is a round gold and glass side table with an elegant golden structure in polished metal, finely covered with blue leather fringes. An accent piece infused with an art deco inspired flair. Polished brass and glass side table, Clipper is characterized by leather fringed upholstery. For those who want their home interiors to stand out, this accent glass table is the ideal solution. Clipper is a glass side table for the living room, with shiny gold metal frame adorned with green leather fringes. The blue coloured glass top offers a round surface. Includes two additional hidden shelves. Clipper is a metal and glass side table, a versatile accessory with distinctive finishes. 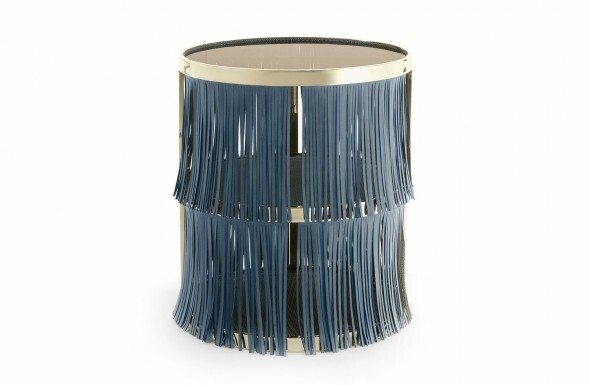 It features a base in golden metal with beige leather fringes topped by a blue glass surface. Clipper is a round glass side table with structure in gilded metal covered with blue leather fringes. This is a luxury accessory designed to furnish and decorate the living room with a glamorous addition. Clipper is a small glass top side table for the living room. With a brown glass top and two lower shelves covered in fabric, it offers a unique accessory, covered in brown leather fringes. Clipper is a glass top round end table with structure in polished golden metal covered with green leather fringes. A small accent table that elegantly fits into classic or modern settings. Clipper is a small glass side table with an art deco inspired look. Perfect as a sofa side table, it’s also an ideal solution for storing luxury liqueur bottles like a small home bar cabinet.